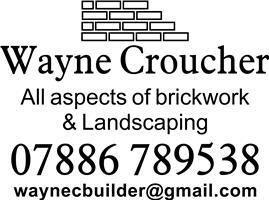 Wayne Croucher All Aspects of Brickwork & Landscaping - Builder, Landscaper based in Walton-on-Thames, Surrey. I’m Wayne Croucher from Walton on Thames, I have now been trading as Wayne Croucher All Aspects of Brickwork & Landscaping for the past four years building up a good client base through this time. We offer a clean friendly and reliable service. Please feel free to contact me regardless if it’s a big or small job or even a question. We cover the following types of work. All types of garden walls. Extensions from digging out to roof plate. All types of drive ways. I have completed a 3 year college apprenticeship and working for a local company for ten years learning different trades. Please contact me on 07886 789538 for all your enquires.